The Zebra P210i has been discontinued. No direct replacement is available. A Small, Lightweight, Easy to Use Full Color Card Printer. Affordable, reliable and simple to use, the P210i offers outstanding price performance value for monochrome card printer users. 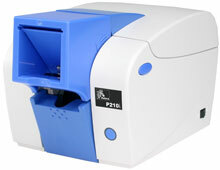 The P210i prints sharp, readable barcodes, ID photos, graphics and text, edge-to-edge, in seconds. Its space-saving, small footprint along with its unique front loading and card exit design is the perfect choice for desktop and countertop applications. The P210i is truly user-friendly. The ribbon cartridge is simple for anyone to load and operate. One three-state LED indicator (green, yellow and red) provides easy-to-understand printer status. Printer ribbon synchronization and driver set-up is automatic. An easy to change, self-cleaning cartridge thoroughly removes dust before printing minimizing print quality issues. Every printer comes with a Pocket Guide reference for ribbon loading, cleaning instructions, and error messages. All units ship with product documentation. Color Thermal transfer, 300 dpi, 120 cards per hour, Serial and USB interfaces, 2MB RAM, 1MB flash. Includes Tracks 1 & 2 Magnetic Stripe Encoder. Includes US power cord. Color Thermal transfer, 300 dpi, 120 cards per hour, Parallel and USB interfaces, 2MB RAM, 1MB flash. Includes Tracks 1 & 2 Magnetic Stripe Encoder & US power cord. Color Thermal transfer, 300 dpi, 120 cards per hour, Parallel and USB interfaces, 2MB RAM, 1MB flash. Includes US power cord. Thermal transfer, 300 dpi, 90 cards per hour, serial & USB interfaces, color printing, 2MB RAM, 1MB flash. Includes US power cord. Order cables separately. See accessories. Color Thermal transfer, 300 dpi, 120 cards per hour, Serial and USB interfaces, 2MB RAM, 1MB flash. Includes US power cord.